I don’t have cancer and somehow felt like it wasn’t my place to even consider ringing this bell. I wanted to show respect to the people who had fought and earned that right because I can sympathize. I did take that picture because I knew I’d want to remember this moment. As I walked out to my car I remembered the past eleven years of living with kidney disease and dialysis. The number of ways it’s impacted my life to trying to just live normally overwhelmed me: Lugging that damn cycler on vacations and trips for NxStage, not being able to camp for more than two nights. having to stick myself with damn buttonhole needles nightly, the pain from that, not being able to make love to wife when the urge hits us while hooked to my dialysis machine, labs, fatigue, maintaining a fulltime teaching gig, missing tour guiding were just a few of the thought going through my head as I fumbled for my keys to unlock the Falcon. 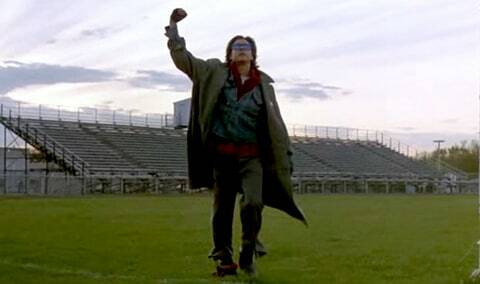 I walked back and rang the hell out of that bell and I walked out like Judd Nelson at the end of The Breakfast Club.